Welcome to Top Shop Automotive Inc.! We’re the Santa Barbara auto repair shop that rises to the occasion, and operates at the apex of quality and service. We have been prioritizing our customers' best interests since 1986, and our personalized approach to auto repair and maintenance keeps us going strong. As a family-owned and operated business, we guarantee excellent workmanship and friendly service at fair prices. When you come to Top Shop Automotive Inc. for auto repairs or maintenance, our service advisors will work with your budget to determine what repairs are absolutely necessary right now and which can wait. Other mechanics may try to sell you services you don’t need. Not us. We will tell you upfront what repairs must be taken care of immediately, what services you will need in the future, and what you don’t need at all. AND we will explain with patience and understanding the entire process for getting the most from your vehicle. Our ASE-certified mechanics specialize in European and Asian imports, select compact American cars, and German diesel engines. If you drive a foreign car in Santa Barbara or Goleta, count on us for any of the following automotive services! 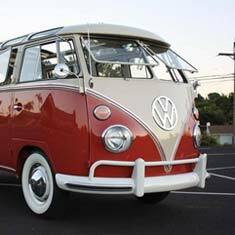 If you own a '60s or '70s Volkswagen Beetle, Bus, Van, Citroen, or another early model VW, Top Shop Automotive Inc. is the place to bring your vintage Volkswagen. Repairing VW classics is one of our specialties! At Top Shop Automotive Inc., we measure ourselves by the quality of service we provide, not the invoice tally at the end of the day. Our strong ties to the Santa Barbara and Goleta communities mean you will always get the best service, whether it’s at Top Shop Automotive Inc. or somewhere else. If we feel your car would be better fixed at another shop, we will make the recommendation. 90% of our new business is referral based. Top Shop Automotive Inc. pushes service, not the dollar. Our commitment to going above and beyond has made us a fixture in the community. We know our dedication to excellence and honesty pays off. In fact, we frequently get third generation customers whose parents and grandparents made Top Shop Automotive Inc. their car care facility of choice! Our auto repair facility is located at 177 South Paterson Avenue in Santa Barbara, which makes us convenient to Goleta, Isla Vista, Montecito, Carpinteria, Los Olivos, Santa Ynez Valley, Solvang, Ventura, Santa Paula, Camarillo, and Oxnard. If you’re looking for us, we’re across from the Goleta U.S. Post Office, right next to La Sumida Nursery. Our shop is also close to Goleta Cottage Hospital, and for students, we’re only five miles from UCSB. See You at the [Top] Shop! Top Shop Automotive Inc. is warm, honest, and dependable. We think of our customers as family, and invite you to experience TOP quality service. Please give us a call or contact us online today!